Seattle Wrap Up – eating my way through Charm City! I didn’t want to bore everyone with all of my Seattle meals – given that this is a blog about Baltimore. It’s in the name for Pete’s sake. But, if you do ever find yourself in the Emerald City, here is the highlight of my tour in alphabetical order. Ballard Loft – We really wanted to hit the pizza company, but they weren’t open yet. We were starving after an afternoon or paddle board yoga, so we split the humus plate. It was ok – sides of warm pita, crispy carrots and some cucumbers. I loved the feta, but hated the 100 or more olives. I wish I had read closer and I would have skipped that part. 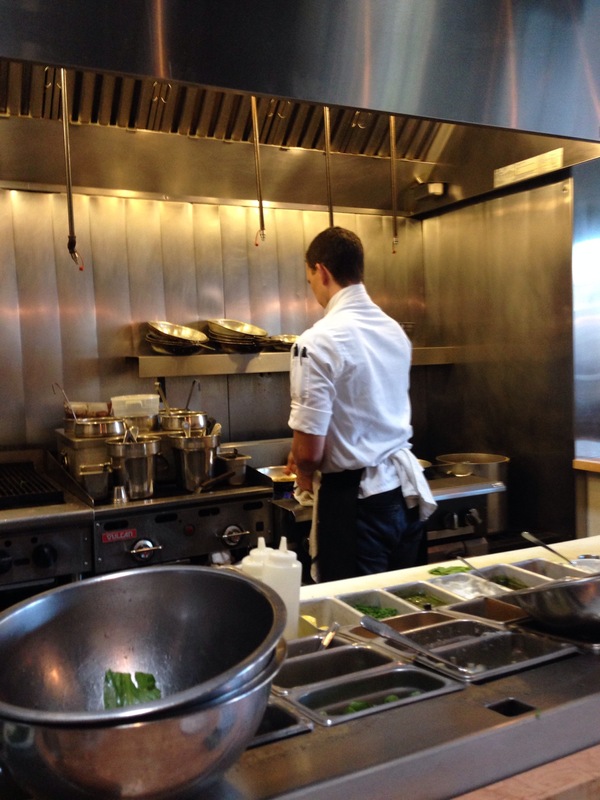 Canlis – read about it… go there. Norms Eatery & Ale House – They have an excellent veggie burger. I went for the spinach salad with a salmon filet. It doesn’t matter how fresh or Alaskan they say the fish is, it is nowhere near as good as a filet this close to Alaska. I hope to one day write about a dish made with a salmon I caught in that great state. Plus, you can add tater tots to every meal and sit inside or outside with your dog. Elysian Brew Pub – I love to head to the local breweries and try the beers that don’t make it to the east coast. We got a sampler, which they picked but were able to add-on the SuperFuzz Blood Orange Pale ale. I think my sister and I both liked the Witticism the best, but we are wheaty Belgium White beer drinkers. For yummy yummy food, I went with the fish tacos – fresh Mahi Mahi grilled and cubed. These were fantastic. I added all the garnish of cilantro, salsa and this spicy peanutty special sauce they had. I definitely ate all three, even though I was stuffed. My sister went for the Vegan Bahn Mi – with thinly fried tofu, jalapeño, pickled carrot and daikon. They topped it with a spicy lemongrass sauce and cilantro, which she happily handed over to me. Fremont Brewery – these guys don’t serve food, but they have their own micro brews. We went with two full size beers: Wandering Wheat & Fremont Summer Ale. I much preferred the wheat. It was your classic wheat unfiltered and slightly sweet. The summer, which was good, was much hoppier. I might have liked it better if I had sipped that one first, but I missed the tangerine flavor and only tasted the barley and hops. OddFellows – this was an odd meal, if there ever was one. My favorite brunch thing to do is split something sweet and then get something savory. We split the beignets. Perfectly pillowy fried dough covered in a mound of powdered sugar. They serve these sweet little gems with fresh fruit jam. Perfect start to go with my coffee. For my main course, I went with the special – a frittata made with short rib, mushrooms and garlicky shallots. I loved the little cast iron skillet with the dollop of sour cream. My sister wanted the eggs benny with avocado and tomato. She asked if she could sub a biscuit for the english muffin and this is where things got a little funny. Somehow – when the manager, who took our order, relayed it our server, she actually ordered a biscuit with an avocado mash. While they were correcting this, we got to taste this concoction. Their biscuit was buttery and flaky, but not at all dry. The mashed avocado topping was tangy with lemon and topped with roasted pumpkin seeds. After a few tables (who arrived after we ordered) finally had their breakfasts, and a second complaint, we finally had her breakfast – which still wasn’t quite what she ordered. Although, it all worked out – we added her poached eggs to the avocado biscuit toast and made it on of the best things she has ever had. I was a little disappointed they didn’t comp our entire $30 check, but they did take her entrée off… Everyone was so wonderful and nice, and the food was quite good – so, I am not entirely sure I will hold it against them. Twirl – this was a quick lunch post workout and pre pampering in Queen Anne. They have a bunch of mac and cheese options including a special of the day. My sister loves their balsamic and Brie mac, so we went with that slightly sweetened version of a classic. We went slightly healthier adding a kale salad, which comes lightly dressed with chopped green apples and a little goat cheese. Paseo – I wrote about it here… Warning: just like my post about Canlis, you may want to travel to Seattle. Tanglewood Supreme – I kind of think these guys deserve a full post. This is a “fisherman to table” restaurant where you can sit at a chef’s bar and watch the goings on. We opted for that and were able to chat a little with sous chef – that is until he got in trouble for forgetting about the carrots. I was craving some local oysters so I went with three – salty, but complemented by the garlicky apple and cilantro mignonette. I also had a huge mid-rare filet of king salmon. They served this cedar plank smoked “rod & reel to plate” fish with a red and jasmine rice and baby bok choy. I was surprised at how well it went with the black berry curry. Once again fish and fruit. Who knew? Kare had two salads as her main dish – the quinoa was outrageous – lemony and tangy – served with some lettuce greens and those wonderfully sweet heirloom tomatoes and Humboldt fog cheese – a creamy blue style cheese. The other salad was green leafy salad with grilled peaches, nuts and a light and fluffy ricotta. Both were great, but the Humboldt cheese was the winner. I also can’t skip dessert. If you think we had enough cheese, you would be wrong, we went with a goat cheese cheesecake with a marcona almond crust. This creamy goodness was drizzled with a raspberry sauce, more of those grilled peaches and a candies basil leaf. Pause… Read that again, they take a basil leaf, dip it in simple syrup and then cool it in the fridge. Yep – candied basil leaf. Now – I love coffee. Seattle is known for their coffee; I had a one or two a day and still managed to avoid a Starbucks. I stopped at just about every small town shop in Fremont – since those were the walking distance ones. It’s summer, and I love an ice coffee. Most of them were cold-brewed with the shops favorite bean. Here is a list of everything I enjoyed in order of preference. Caffè Fiore – This one was my favorite by a long shot. These guys in Ballard are organic – they roast with another local Seattle fav. This was a really great coffee; mild with great cherry notes. ETG Coffee – Actually right up there with my favorite. this place is tiny, tiny, tiny but gave me a great vacuum-pressed iced coffee. It was strong, even though not quite as dark as some of the others locally – but it hit the spot! Lighthouse Coffee – these guys don’t get enough love. They are up on top of a huge huge huge hill. It’s not all that big when you think about the west coast, but huge compared to anything in Baltimore. They roast their own coffee and cold brew their favorite for their iced coffee; it was very smooth and slightly buttery. Cafe Ladro – A sweet little place serving a medium bodied roast and with the cold brewing, there was no bitter after taste; I could really taste the fruity notes. They are a local chain, but not a Starbucks, so it counts. Fremont Coffee Company – this shop probably has the best space with a wonderful outdoor porch and plenty of seats. But, their coffee is meh, kind of weak. Not terrible, but not great. Just fine iced coffee. Still good enough, I would go there if I wanted to sit outside while enjoying a cup of joe. Story Time Coffee – meh… even though they have a cute logo and lots of great accessories, they were a little pretentious and the coffee wasn’t special. This entry was posted in Brunch, Coffee, Detour, Dinner, Lunch. Bookmark the permalink.